“Do they not blaspheme the fair name by which you have been called?” (Jas. 2:7) The entertainment industry is once again using its clout and prestige to blaspheme the fair name of Christ and it should not be supported. It’s crazy and insane for Believers in Christ to hold such people up as heroes while they denigrate our Lord. of Christianity.” The only thing this book does is mangle history with conjecture and supposition. Despite the respect and admiration Hanks and Howard have received in the past for great movies like Apollo 13, they have to lose their place of esteem for participating in such a production as this. Concerning the book the movie is based on, Mark Creech (AgapePress) writes, “Few things have done more to injure the witness of the Church than attacks on the deity of Christ, the reliability of Scripture, and the rise of feminist ideology. This demonic trinity has counterfeited the truth, ruined countless lives, and resulted in the eternal damnation of many a soul. 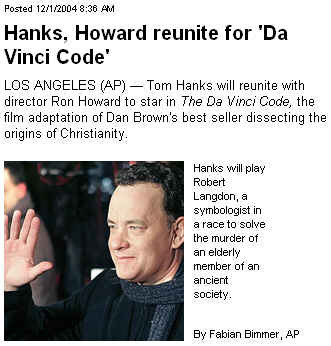 Now these three have been brilliantly combined into one profoundly evil witness in Dan Brown’s latest best-seller book, The Da Vinci Code.” Entire article Here. We can imagine that the movie will be as inflamatory and derisive as the book proved to be. It is fiction, peppered with historical references, to give it an air of believability. Dan Brown’s novel alludes to a marriage between Jesus and Mary Magdalene with children hidden away in France, and it challenges the divinity of Jesus Christ. We can only hope that this movie is not as popular as the book. Attacks on Christ and the Church are not new as the Gospel has weathered them all, but every Christian should be aware and prepared to answer these lies. Tom Hanks and Ron Howard have now associated themselves with blasphemous fables in order to entertain others and increase their wealth. Paul wrote to Timothy, to “…have nothing to do with worldly fables….” May I also suggest that such a movie, based on Brown’s work of fiction Da Vinci Code, is not worthy of Christian support. Instead of buying a ticket to this movie, give the money to someone in need who could be rich in faith. And let us pray that their efforts do not advance; but that God would hinder them from profiting in this matter.